Want to WIN £50.00 worth of FREE vaping gear? Celebrating #Stoptober we are giving away a Mystery Box packed with £50.00 worth of products. LIKE & SHARE this post to #WIN! Psst! 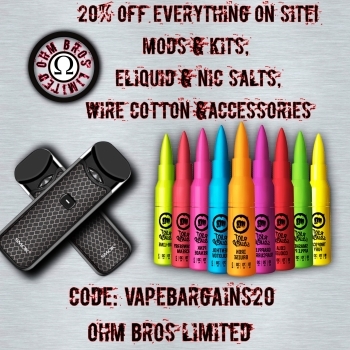 Grab a bargain and also get 20% OFF all branded juices this month only. Winner announced on October 31st. Best of luck!